Often, the first impression of the quality of a medical cable comes from how it looks and feels to the user. Regardless of the components contained within the cable jacket, it is the exterior of the cable that is the most observable indication of the quality of the product. Besides the appearance, the tactile feel of a cable and is how it is perceived by the user is largely influenced by the jacket material and also by the overall flexibility of the cable. 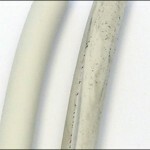 While white is often considered an appropriate color for medical devices, a white cable jacket will show marks or dirt which may detract from the “clinical look” of the cable assembly. Other than white, neutral colors are most commonly used and include light grey, darker greys and black. 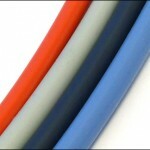 But, in addition to neutral colors, cable jacket can be extruded in almost any custom color. Light grey is by far the most common color for cable jackets. This neutral color compliments equipment by not being prominent. 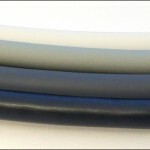 Darker greys or black are often recommended for cables that will be prone to be becoming dirty or scuffed in use. Colors are commonly specified by Pantone number in the U.S. or RAL numbers in Europe. When the cable jacket must match the color of an existing product it is highly recommended to match the resin color to a sample rather than depend upon either a Pantone or RAL number.